For golfers, Sea Trail features 3 championship golf courses, 11 within the town of Sunset Beach, and more than 100 in the Grand Strand area. Golfing year-round! For beach lovers, you are just a minute away from one of the best beaches along the Atlantic coast! Sunset Beach features 4 miles of white sand beach that is perfect for building sand castles, kite flying, playing bocci ball, running or biking. For families, kids activities abound. The Village Activity Center at Sea Trail features indoor and outdoor pool, hot tubs, kiddy pool, and weight room. Bike rentals available through the Village Activity Center in the summer. Sunset Beach features numerous putt-putt courses, a Planetarium and nearby Ocean Isle Museum. To the south, Myrtle Beach has many offerings, including the Ripleys Aquarium and Broadway at the Beach. This 1st and 2nd floor vacation property features cathedral ceilings and a large open great room and dining area on each floor. This spacious unit has 3 private entry doors and 3 private baths for the utmost of convenience. Also, the master bedroom has a king bed with a private bath, TV and access to the screened porch. Two other bedrooms (one with 2 Queen beds and other with 2 Queens) also have private baths, TV's, wall-mounted hair dryers and much more. This is a great layout for multiple couple getaways or for mixed family groups. Other condos with other bed configurations are also available. Please email us to find out more. Reference pets: While this condo is pet friendly, pets must be approved in advance. Only select breeds are permitted and pets must be at least 2 years old and crate trained. Rates include bed and bath linens, departure cleaning, Wi-Fi, utilities, condo parking and starter supplies (paper towels, toilet paper, dish and dishwasher detergent. Located near the NC/SC border, Sunset Beach is easy to find, yet off the beaten path and just on the verge of being 'discovered'. Not commercialized, yet enough good restaurants and shopping that you never have to leave the area! Easy flights into Myrtle Beach or Wilmington Airports or an easy drive from any midwest or east coast location using I-77, I-73/74 Corridor or I-95. Come discover paradise -- you won't want to leave! 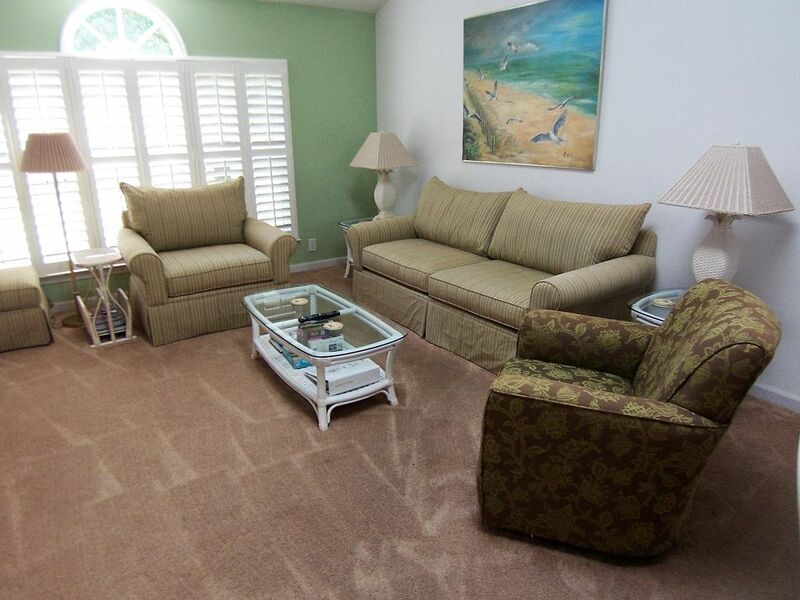 Enjoy a fully furnished 3-bedroom vacation rental with all the comforts of home. Fully equipped kitchen, linens and towels are all included. We even include 4 beach chairs. Bike rentals available through the Resort at Sea Trail. Daily or weekly memberships available to the Village Activity Center at nominal guest fees. Minimum of 8 place settings all inclusive, including wine glasses, blender, lobster pot, etc. Village Activity Center (VAC) available with indoor and outdoor pool and workokut facility. Contact Village Activity Center at Sea Trail for more information - 910-287-1160. Access to Village Activity Center for nominal daily or weekly fee -- includes indoor and outdoor pools, hot tubs, workout facility and group activities for kids and adults. Only $80 for the week for a family of up to 6! $60 for couples.